Sunday has once again arrived all too quickly and here at Halloween Love that means one thing – it’s time for another batch of incredible poster images from the thriving alternative art community! So far I’ve revealed my personal favorite posters that pay tribute to: Jaws – Stephen King’s IT – Alien – The Shining – The Thing – Ghostbusters – Jurassic Park – Scream – A Nightmare on Elm Street – Halloween 3: Season of the Witch – Halloween – Silence of the Lambs – The Friday The 13th franchise – An American Werewolf in London – The Fly and Gremlins. This week I thought it would be fun to take a nice relaxing road trip across Texas, and maybe we can track down that welcoming family who ALWAYS insist visitors stay for dinner! 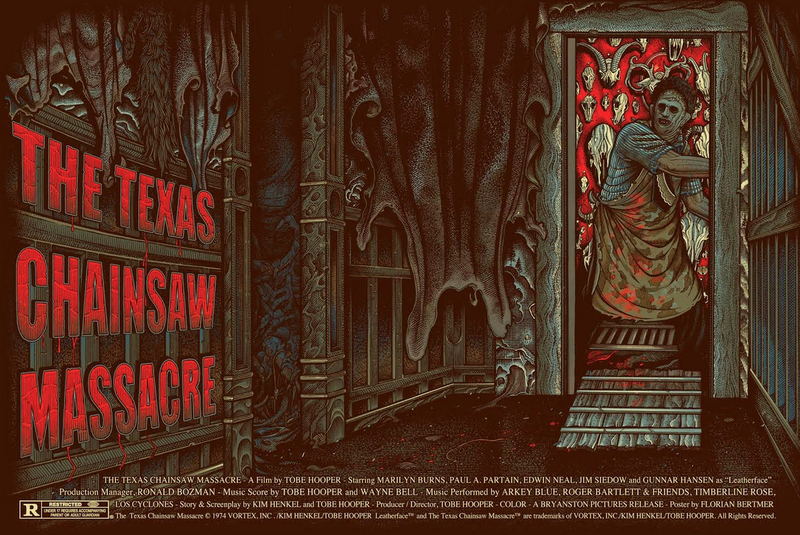 It’s time for a good old fashioned Texas Chainsaw Massacre! 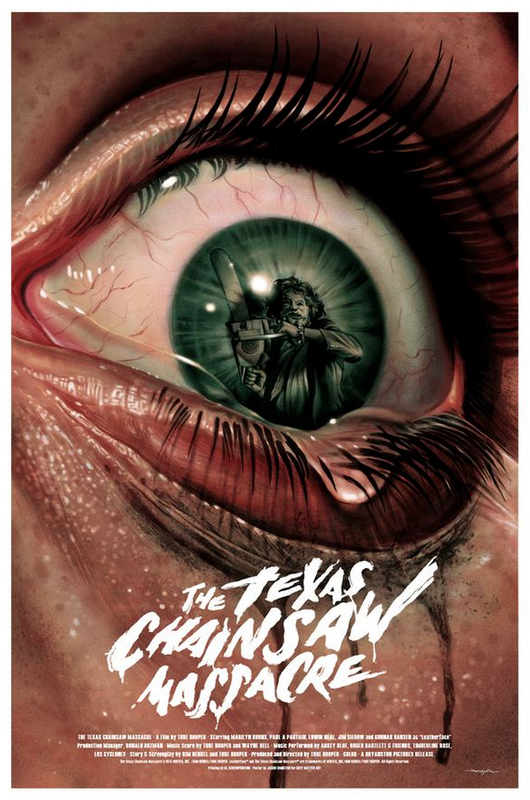 As always this list showcases MY personal favorite posters. The select few that pushed my art loving buttons and made me want to wear some hot pants under a REALLY big apron! There are hundreds more incredible designs out there but these are the best of the best in my humble opinion. Gurch called this gloriously brutal piece of art “noisy” on his DeviantArt page and I can’t think of a better way to describe it. It’s an illustration that almost instantly teases your brain, forcing you to think of the sounds contained within. And just between you and me … I’m pretty sure I started making a very gentle ‘buzzing’ noise under my breath the first time I laid eyes on it. I love the style, I love the subtle color wash over the details, and I love the energy contained within. I’d happily hang this on a hook in my home! 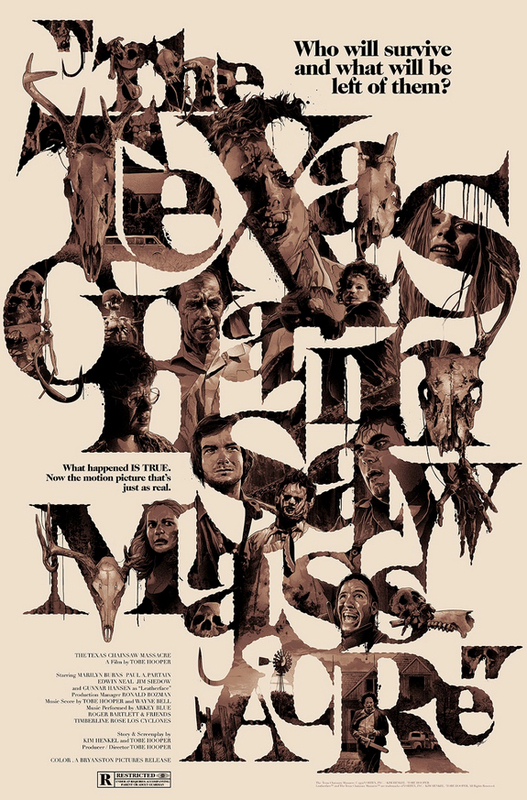 Jason has produced some incredible work in recent years, but even by his own high standards this Texas Chainsaw Massacre piece is something truly special. It’s the sort of poster that just reinforces my belief that the big studios should be using artwork like this to sell their movies every chance they get. Just look at it! A traumatizing masterpiece that perfectly captures the relentless terror Sally experiences toward the end of the movie when all you can hear is the sound of her screams! 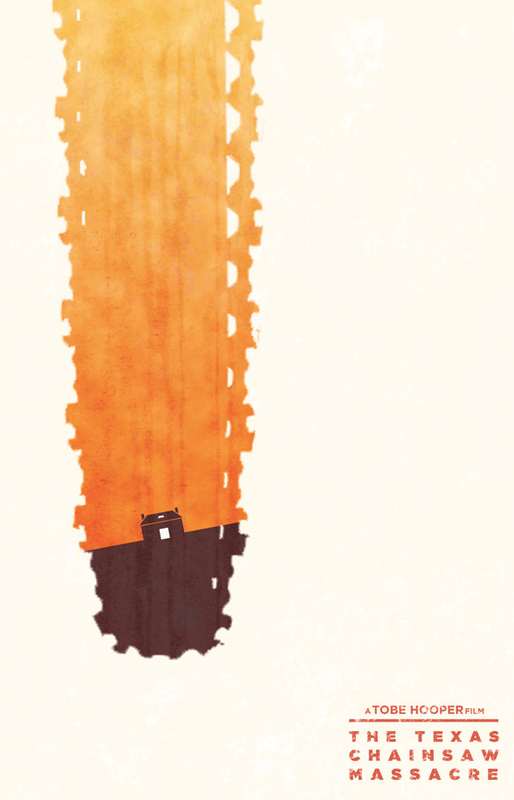 Javier has a created a stunning series of poster images called “Tools” that feature familiar dangerous objects from several popular movies combined with the silhouettes of the characters who love to carry and use them! 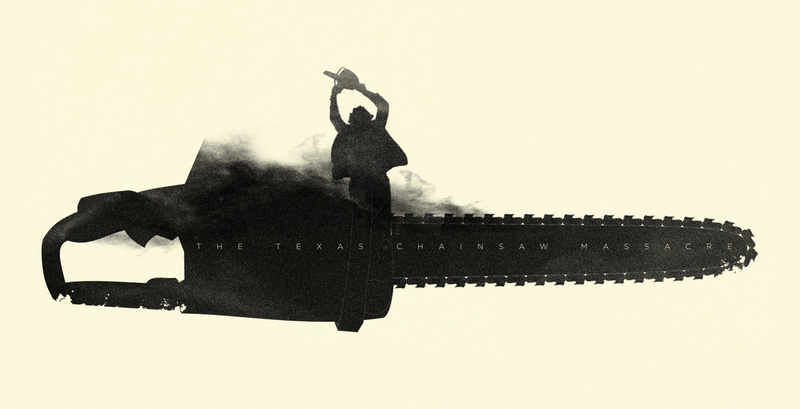 It’s a seriously cool concept, and the way Javier has blended the chainsaw into the smoke and figure at the top of the piece just ticks all the boxes for me. I’m a silhouette junkie when it comes to art, I just can’t get enough! I can only imagine how much time was spent planning this insanely epic piece and getting the design and layout just right. Gabz has a talent for creating posters that feature characters and scenes from movies within restricted spaces such as the silhouette of a body or face, but to squeeze this much detail, content and life into those slender letters is something else! There is just SO much to see within the art, new details and clever little touches just keep appearing as your eyes move around the image. Jaw-dropping and uniquely brilliant! 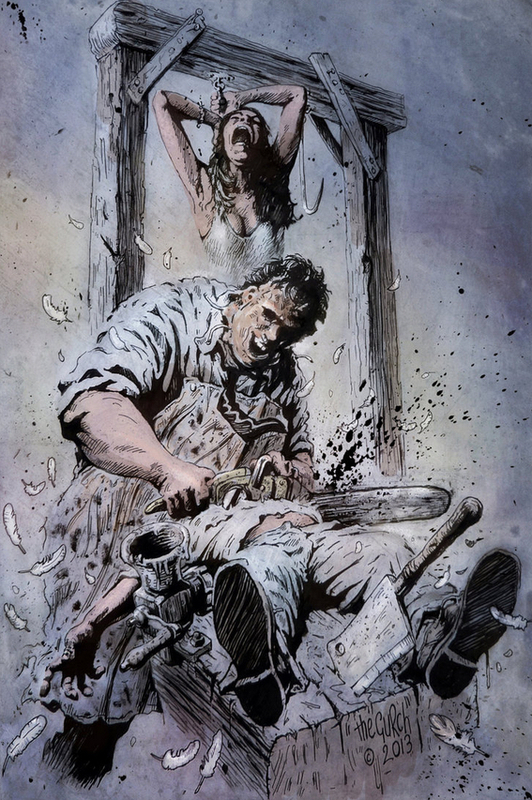 Jeff’s beautifully illustrated and atmospheric poster delivers a victim’s eye view of Leatherface in that classic raised chainsaw pose we all know and love. The subtle background gives it an awesome layered effect and the end result is a damaged and doomed work of art. 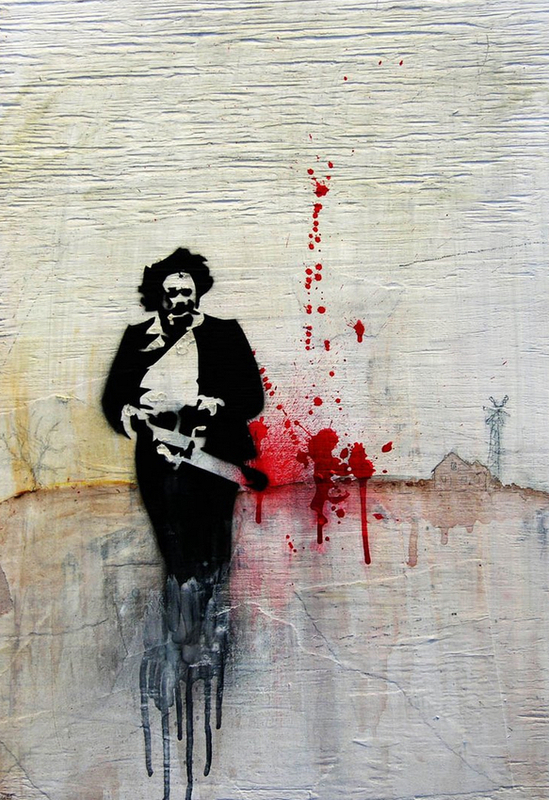 This simple but striking piece by hexxxer was created on a rough piece of plywood, and let’s face it, if ever there was a movie that almost demanded to have artwork made for it using old, weathered and natural resources it’s The Texas Chainsaw Massacre. The wood gives the image some pleasing texture and depth that you don’t normally see, and the various media used in the illustration pull together to form a finished piece that REALLY works. It’s stark, dry and feels appropriately dangerous! 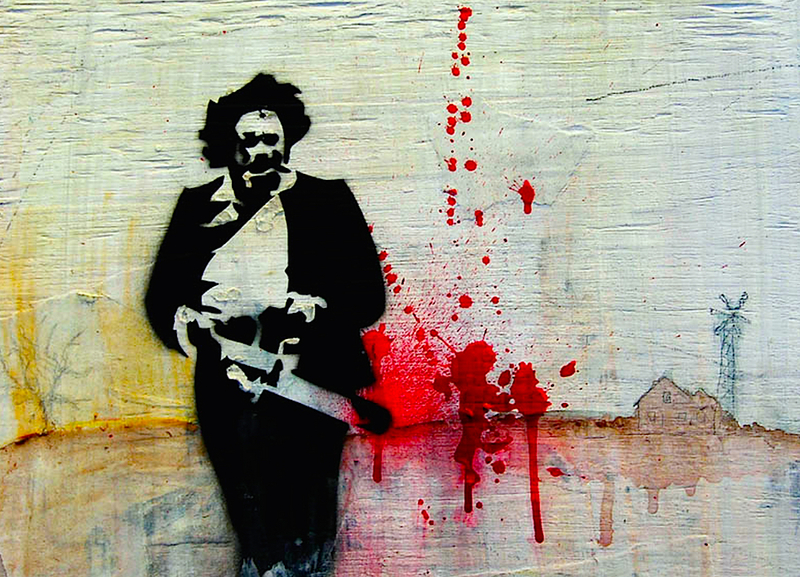 Seconds after giving Kirk some serious head trauma and dragging his twitching body out of sight, Leatherface rises triumphantly, slams a sliding door shut, and creates an unforgettable moment that will forever reside in the horror movie Hall Of Fame! Florian’s incredibly detailed poster is a perfect tribute to that scene and an artistic triumph, packed with all the gruesome decorations that made the house so horrifically awesome. An instant choice for the list and one of the best alternative movie posters I’ve seen in recent times. We finish for today with this seriously cool minimalist poster by Paul, which manages to be incredibly eye-catching and effective just by using a few basic shapes and a splash of vivid color. 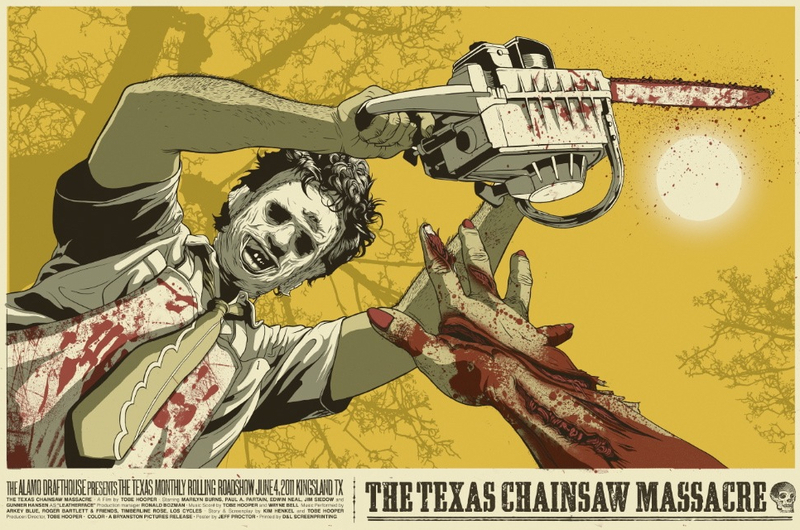 I’ve seen a lot of similar designs but this one got my vote because of the deep orange sky that fills the chainsaw blade and the atmospheric vibe it creates. For further information on any of the posters you have seen here today or the artists who created them you are only a Google search away.